I'd like to welcome one of my favorite Middle-Grade authors, Barbara Dee to Book Club Exchange, a (somewhat) regular feature on Booking Mama which highlights anything and everything book club-related! Earlier today, I reviewed Ms. Dee's latest book TRAUMA QUEEN; and I found it to be a very entertaining story about a unique mother-daughter relationship. I hope you'll enjoy Ms. Dee's essay about how she went about writing a mother-daughter book! Sometimes kids ask me how I know what it feels like to be twelve. This is why it seems so natural for me to write in the voice of Marigold, the main character of Trauma Queen. I still have painfully strong memories of being thirteen years old, and cringing at my mom’s behavior. It doesn’t take much for me to access those thirteen-year-old feelings; I haven’t outgrown them or consigned them to some sort of emotional compost heap. But of course I’ve had a lot of birthday parties since then—and in fact, I’m now a mom of three teenage kids. So like every other mom, I have the privilege of a dual perspective—and that means I can empathize with both the mom and the daughter in the book. In a way I guess you could call Trauma Queen the product of a mother-daughter book club—with me as the only member! Yes, the book is daughter-centric: you get Marigold’s perspective throughout, and for the most part, her reactions are pretty reasonable. She can be a bit judgmental sometimes, but how can you blame her? Becca is quite a challenge to have as a mother—not just because of her over-the-top performance pieces, her tendency to get confrontational, and her affinity for dramatic exits. She also doesn’t get—or doesn’t want to get—how her own behavior affects her daughter. She says she “cherishes those mother-daughter chats,” but is she listening when Marigold tries to talk to her? Not really. At least, not always. But is Becca a bad mom, or a “mother of doom?” Not at all. She’s an artist—maybe not a great artist or even a good one, but one who’s trying her best to stay true to her art, while singlehandedly raising two daughters. She loves both her daughters deeply—she just hasn’t figured out how to balance work and family. She also needs to work harder on PR—not just with her audience, and with her community, but also with her daughters, especially Marigold. Okay, that’s an oversimplification. But I do believe that Becca’s heart is in the right place. She makes mistakes (a few of them big ones! ), but she also tries to make things right. And how can you fault a mom who tries to teach her daughter that “whenever someone is getting in your face, you need to look ‘em right in the eye and speak out?” Standing up to bullies, standing up for yourself, not being afraid to challenge authority—those are some of the most important lessons we can teach our daughters, and Becca doesn’t shirk that responsibility. Plus, and believe me, I say this with a mother’s love, Marigold isn’t the most docile daughter in the world. Or the least drama-queeny, either. In all fairness, she’s really a handful, too. So, as a mom myself, do I see Becca’s point of view? Do I empathize with her as she tries to navigate those (sometimes tricky) mother-daughter waters? Do I actually like her? Yes, yes, and yes. But as a daughter, would I want her for a mom? No way. She’d drive me crazy. Trauma Queen fab giveaway! 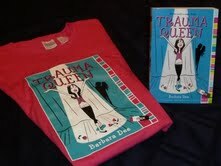 Three lucky winners will receive one copy of TRAUMA QUEEN by Barbara Dee along with a limited edition t-shirt! To enter, send an e-mail to TQgiveaway@gmail.com. In the body of the e-mail, include your name and e-mail address (if you're under 13, have a parent enter for you). One entry per person and prizes will only be shipped to US or Canadian addresses. Entries must be received by midnight (PDT) on 5/13/11. Winners will be selected in a random drawing on 5/14/11 and notified via email. 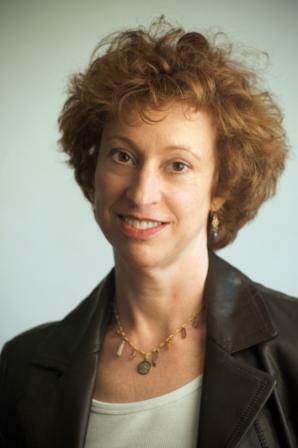 Barbara Dee is the author of the tween novels Just Another Day in my Insanely Real Life, Solving Zoe (2010 Bank Street Best Children's Books of the Year), This Is Me From Now On, and Trauma Queen. She lives with her family in Westchester County, New York. You can visit her on the web at www.BarbaraDeeBooks.com. I am so grateful to Ms. Dee for taking time from her busy schedule to write this special guest post. If you are interested in participating in a future Book Club Exchange, please contact me at bookingmama(at)gmail(dot)com. I'm amazed when people remember what it feels like to be 13. I forgot all that stuff as I got older and tend to see it all from an adult's perspective until I read a book that brings it all back.